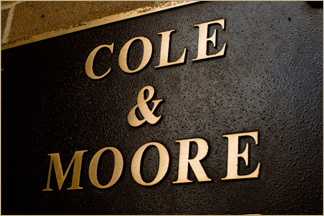 Cole & Moore, P.S.C., located in Bowling Green, Kentucky on Fountain Square and founded in 1974, is a full-service, general practice law firm whose attorneys strive for favorable resolutions to complex legal issues throughout the Commonwealth of Kentucky. With expertise in a diverse range of practice areas, the firm has earned a solid reputation for solving legal problems across a wide spectrum of legal issues including personal injury, criminal law, auto accidents, medical malpractice, workers comp and more. For nearly forty years, Cole & Moore and its predecessors have maintained a statewide insurance defense trial practice, in both state and federal courts. The firm has been recognized by U.S. News and World Report as having Tier 1 ranking in litigation and its attorneys awarded the designation of “Preeminent Attorneys” and “Super Lawyers”.